We all love to look at tropical fish photos, so here is a chance to show all of us what you have accomplished. Don’t be shy; we would all love to see them! 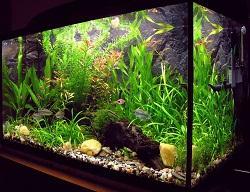 Some people are masters at aquarium aquascaping, creating some amazing setups and others are just starting out. It doesn’t matter which category you fall into, it is still nice to have your efforts recognised. Here we will try and create a tropical fish gallery of our reader’s aquariums and we hope that if you are just stopping by, you will share your pics too. Add a little personal touch to your submission! Aquarium pictures are only half of our goal. Why not write a story about your trials and successes to go along with it? You would be surprised how a short success story can be just what’s needed to keep the motivation levels up and help people succeed. It’s all very easy, just drop me an email to info(at)all-about-tropical-fish(dot)com with your pictures and a story, and I will create the page for you. I started this small tropical tank around 6 months ago.